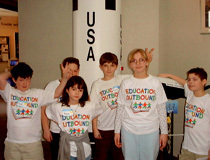 (1 trip in March ‘01) - the children saw an awesome planetarium show at the Christa McAuliffe Planetarium in Concord, NH. The children learned about the current night sky and the latest information about space! They were incredibly stimulated and fascinated by the imagery and experience, as each of them became a part of the spectacular night sky.